Reduce air-conditioning costs by keeping heat out of your building. 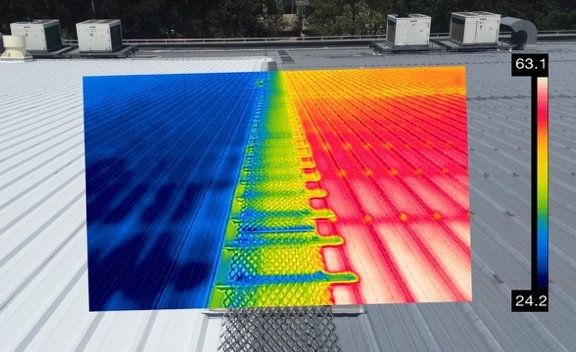 The majority of electricity in Australian buildings is spent on air-conditioning. Once hot air enters a building, it takes a lot of energy to cool it down to keep occupants comfortable. A traditional roof is like a heat-sink. The surface temperature rises quickly and significantly, such that on a warm day it can be too hot to touch. Even with an insulated ceiling, considerable heat enters the building through the roof. This hot air must then be cooled by the air-conditioning equipment. Rather than letting hot air into your building and then paying to cool this air, it makes far more sense to stop the hot air from entering in the first place. An approach to creating a cool roof is to apply a heat reflective roof coating (or heat reflective roof paint). This roof coating reflects up to 90% of the heat from the sun and reduces the surface temperature of the roof by up to 40 degrees. The materials in the coating reject solar heat, by reflecting solar radiation (solar reflectance) and releasing heat that has been absorbed (infrared emittance). By reducing the amount of hot air entering your building, your air-conditioning costs significantly reduce. A study of the energy savings in air-conditioning, at sites across Australia for companies including Woolworths, Westfield, Charter Hall, Bunnings, Department of Defence and Melbourne Airport, demonstrated a national average 42% reduction in energy consumption after applying this coating. The image below shows a roof in it’s original condition on the right, and with coating on the left. The thermal imaging shows how much cooler the coated surface temperature is. Reducing the amount of air conditioning required within your building provides the additional benefit of less wear and tear on your plant and equipment. Coating the roof has other benefits too – it helps stop water leaks and extends the lifespan of the roof. The efficiency and output of a Solar PV system degrades as the temperature of the panels gets hotter. Applying the coating under a Solar PV system can help cool the environment surrounding the panels and improves their performance. Please contact us if you would like to discuss if Cool Roofs would benefit your business.